Find this review on ScreenComment.com! 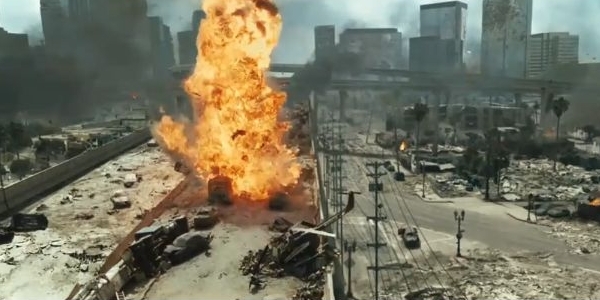 “Battle: Los Angeles” can be summed up entirely by its title: blunt and to-the-point. Though I was dubious about the director (Jonathan Liebesman), who has now made not one but two films with colons in their titles (the other being the excremental “Texas Chainsaw Massacre: The Beginning”), I was pleasantly surprised by “Battle.” It’s fun, exciting, and just sci-fi-y enough to keep things interesting. That it has precisely nothing to say isn’t really a bad thing—it’s a big, loud, CGI film, and if that’s what you’re in the mood for, you’ll be perfectly content. 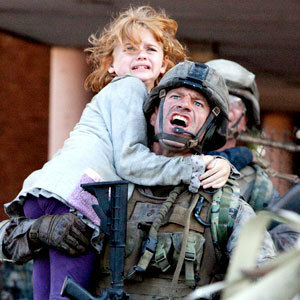 “Battle” stars Aaron Eckhart as a has-been Marine Staff Sargeant just getting ready to quit the service after 20 years. His last tour involved several of his men being killed, and rumors about his competence as a leader are flying. Unfortunately for him, just as he’s ready for retirement, aliens show up and lay siege to planet Earth. Without knowing what they’re up against, the military is mobilized to move civilians away from the California coast in advance of a bomb drop. Eckhart, who has held his own in the past against the likes of Gwyneth Paltrow, Nicole Kidman and, ahem, Katie Holmes, finds himself in over his head with the beasts and with his new platoon of Marines, none of whom are ready to trust him. Much testosterone-laden male bonding ensues and, of course, man eventually prevails, though not without what must be a record number of fiery explosions. The aliens themselves are a strange combination of slimy anthropomorphism and jarring mechanization; they seem to be only partly organic, with huge guns and flame throwers built directly into their limbs. In a strange, liminal moment in the narrative, Eckhart and costar Michelle Rodriguez (very underutilized) drag a wounded alien into a building and proceed to stab every part of it they can identify to determine what will kill it. 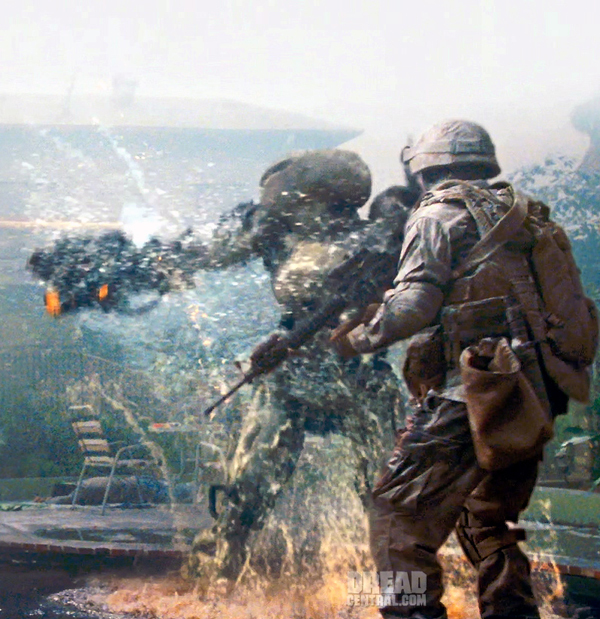 While reminiscent of earlier, clunkier aliens in films like “Independence Day” (1996) or even “Signs” (2002), “Battle’s” complete indifference to its extraterrestrials feels a little strange, especially after the masterpiece that was “District 9” (2009). As Eckhart tears the alien apart with his bare hands I couldn’t help but think, is this a war crime? Is it atrocity? Clearly, one isn’t supposed to read that deeply into a film that, I point out again, has a colon in its title. Nevertheless, the fault in “Battle” is its complete and utter lack of any sort of message, political, philosophical or otherwise. While I’m not asking that every big-budget alien flick contain some subversive social missive (watch out, “Cowboys and Aliens”), it would be nice if it took more than a gratuitous “ooh-rah!” to sum up the entire movie. Then again, it’s almost summer—soon, we’ll be faced with much, much worse. 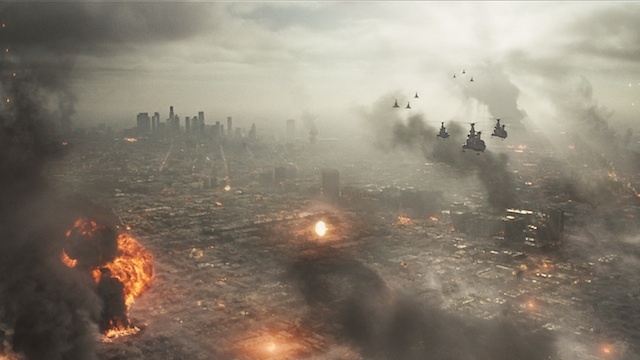 “Battle: Los Angeles” is currently in wide release. From the producers of “King of Kong: A Fistful of Quarters” (2007) comes another tale of a quirky subculture (this time, professional magic) that turns out to be disarmingly endearing, even poignant. 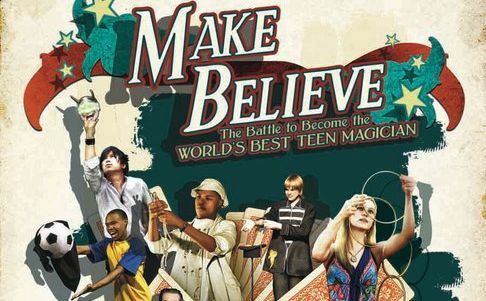 “Make Believe” follows six teenage magicians as they prepare for the World Magic Seminar in—where else?—Las Vegas, where one of them will be crowned Teen World Champion. Much in the mold of other gifted-kid documentaries of the past few years (“Spellbound,” etc. ), the film follows each individual competitor enough to get the audience really invested, but also manages to keep the pace moving. It’s hard not to get attached to the preternaturally talented Japanese boy who lives in the mountains, or the goofy South Africans who create a whole magic routine around soccer in honor of the World Cup. The film’s production values are huge, having been shot on at least three continents, but the effect isn’t jarring or disjointed—everything moves seamlessly towards the Final Countdown…I mean, competition. For all the film’s wow factor, though, there is a definite weirdness in the world of competitive magic and even as glossy and soulful a film as “Make Believe” can’t totally obscure it. Adult magicians and their acolytes appear periodically, and even though most of them seem highly intelligent and well adjusted, there’s something about all of them that’s just—off. The subculture’s treatment of gender, for one, is uncomfortable at best—only one of the competitors is female, and for her routines she’s tarted up to a degree that’s impossible to overlook. A female mentor, at one point, even advises her to flaunt her assets more—and it’s clear she’s not talking about card-shuffling skills. The male competitors, too, are clearly beings on the fringes of their social groups, and the World Magic Seminar begins to seem as the film goes on like a proverbial Island of Misfit Toys. The teens’ determination to master esoteric, extremely difficult magic skills becomes a metaphor for their desire to fit in with a superficial, myopic society that can’t really appreciate them as they are. The climactic competition becomes both a catharsis and a coming together for the teens, and the film’s coda (six months later) gives “Make Believe” a nice feeling of closure. Though we get to watch each of the kids perform and refine their routines, it would have been more interesting to have them take us behind the scenes a bit, and show us some tricks of the trade. But in keeping with the spirit of magic, it seems, both the kids themselves and the specifics of their routines remain something of a mystery. 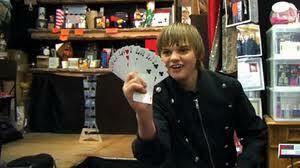 “Make Believe” which won the Best Doc award at the LA Film Fest 2010, opens in theaters in May.